These globe-shaped blooms in brilliant magenta-purple contrast beautifully with its cool and refreshing bluish-green foliage. Wonderfully catchy and everlasting in color and shape, their showy flowerheads are popularly used as cut flowers or dried flower arrangements! Like the Butter Daisy (Melampodium divaricatum), it is a sun-loving and hardy annual plant that is so easy to grow, needing very little maintenance, yet rewards so generously with profuse flowering. A must-have for summer gardens and butterfly lovers! Features: Gomphrena globosa, a member of the genus Gomphrena, is a low-growing compact annual with a typical height of 30-60 cm, with some cultivars reaching 90 cm tall. It has a bushy subshrub appearance with a spread of 30-45 cm with branched stems that are stiff and erect. Leaves are narrow, oblong to ovate, 3-10 cm long and pubescent, in various shades of green, from medium green to greyish- and bluish-green, sometimes with a purplish or silvery tinge. Borne atop long and upright spikes are showy clover-like flowerheads, about 2.54 cm across and a little longer, ranging from the original color of magenta-purple to other cultivar colors of purple, red, white, pink, lavender and even orange, yellow and blue. It is these numerous brightly colored papery-textured bracts, fashioned together into ball-shaped or globose flowerheads, blooming abundantly non-stop through the year in the tropics or from summer until fall in colder regions that make them appealing. Appearing in between the bracts are tiny white to yellow trumpet flowers which are the true flowers, though inconspicuous. 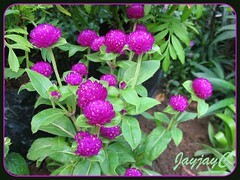 Culture (Care): Globe Amaranth is an easy plant to grow, needing minimal attention. Moisture: Medium water requirement. Though drought and heat tolerant, best growth is achieved with regular watering, especially during hot and dry weather. Soil: Adaptable to any soil type, even tolerates poor or clayey soils. Potting soil mix of 2 parts peat moss to 1 part each of loam and sand is preferred to hold moisture and keep it well-drained. Others: To encourage branching and hence more blooms, pinch back the tips of young plants. 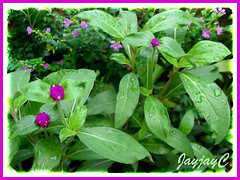 Taller plants may need staking during rainy seasons. In hot and dry weather, mulching is advised. Overwatering may cause roots to rot. Monthly feed with a balanced fertilizer is beneficial. 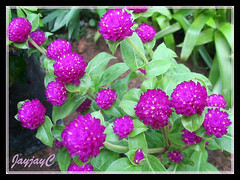 Globe Amaranth is usually free of serious pests or diseases, though occasionally bothered by mildew. For subtropical regions: Hardiness: not applicable as they can be grown as annuals in most USDA Zones. However, it cannot tolerate frost but is quite tolerant of summer heat and drought. 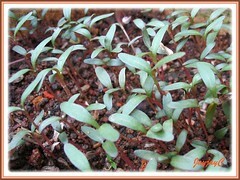 Another alternative method of propagating is by simple layering. Just bend down a stem and cover the section that has a node with soil. Keep it well-watered to encourage rooting. Sever from the parent plant when already rooted and transplant as a new plant. 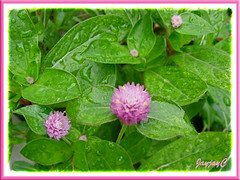 Usage: Being low and compact, Gomphrena globosa will be excellent for garden borders, annual beds and rock gardens. Ideal too for container gardening, with pots at porches, decks or windowsills. 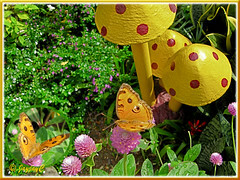 An attraction to butterflies, as seen in the right image, Chilades pandava is a frequent visitor. Good as cut flowers as they are long-lasting and even better as an everlasting for dried flower arrangements with its ability to retain color and shape indefinitely. (Prepare the everlasting by cutting stems just as the flowerheads are beginning to open and then dry them by hanging upside down in a warm, dark and airy place). ‘Cissy’ – white flowerheads, smaller. Our pink-colored Bachelor’s Buttons that grew from seed germination in May flowered for the first time! 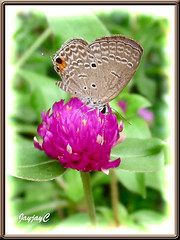 Gomphrena globosa or Globe Amaranth is such an attractant for butterflies! They just love its enticing globe-shaped flowers that appear endlessly during each season. Many butterfly species of various sizes, colours and shapes have been seen enjoying the blossoms. 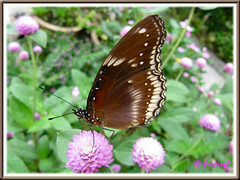 Frequently seen are the Plains Cupid and Peacock Pansy, and more recently, the Jacintha Eggfly. Bachelor’s Buttons is a highly recommended annual for butterfly lovers! I shall working in this Gomphrena plant of induced mutation studies. so please grant me any work is already available please send to my address. Sorry to say that we’re just simple and passionate gardeners, sharing here with like-minded people who love gardening, our experiences of growing this plant with inclusion of some extra information sourced online. We’re not botanists.